*Falling Waters Beach Resort is gated community with cascading waterfalls, walkways, lakes, fountains, and beautiful vibrant tropical plants and trees. Enjoy a 600 foot lazy river pool, large clubhouse with a dance floor, library, brick paver walkways & parking areas, shuffleboard court, tennis center, bocce ball court, and lap pool. 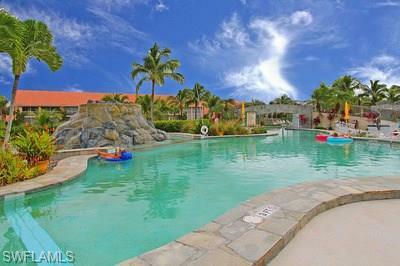 This condo is beautifully decorated and features views of the lake and volcano fountain. Two bedrooms, two bathrooms, a fully equipped eat-in kitchen, a formal dining area for 6, a screened-in lanai, laundry room, and an over-sized one car garage completes the package. Conveniently located close to downtown Naples beaches and Marco Island.